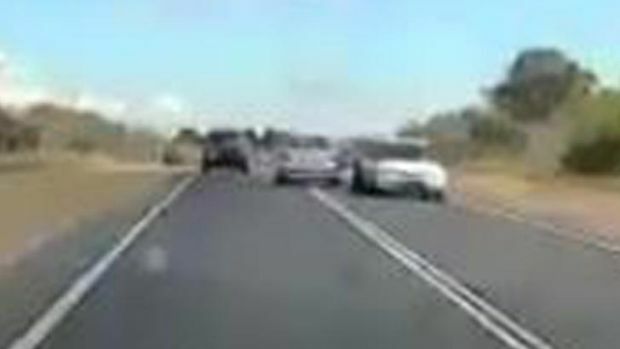 Shocking footage of a car narrowly avoiding a head on collision with two oncoming vehicles south of Perth has been released ahead of the WA long weekend. Mundijong Police uploaded the footage onto their Twitter page on Thursday. Residents in the City of Joondalup are seeing red over a new green initiative by the council. A teenage girl claimed she fled in fear after a group of people wearing clown masks tried to grab her in Kwinana in Perth on Saturday evening. Courtesy Seven Network. A Margaret River band’s bluegrass cover of one of Toto’s iconic hits has been viewed more than a million times. Former Liberal MP Michael Sutherland posts a controversial to his Facebook page as part of his campaign to join the City of Perth council. Emergency crews blocked traffic when a fire engulfed the rear brakes of a bus in Adelaide. Courtesy Sunrise, Seven Network. A man’s body has been found at an industrial estate at Salisbury in Adelaide’s North. Detectives are investigating circumstances around the death. Courtesy Sunrise Seven Network. Dashcam footage has captured a frightening near miss in Perth’s southern suburbs. They are still looking for the driver behind the wheel of the drifting car, believed to be a Ford Falcon. The hair-raising footage was captured by another motorist on their dash-cam just before 11.40am on September 9 on Thomas Road, Anketell. It shows the car drifting onto the wrong side of the road and narrowly missing two oncoming cars, one of which is carrying a trailer. The other oncoming car can be seen swerving left into the gravel, to avoid the drifting car and a potentially fatal head on crash. The offending car then slowly returns back towards the left and into the correct lane. Mundijong Police Acting Sergeant Nick Brown said police hoped to speak to the offending driver soon. Acting Sergeant Brown said the footage was provided by a member of the public, via an online traffic complaint. “We are obviously running a traffic operation this (long) weekend and this is exactly what we are targeting. Dangerous motorists that cause collisions,” he said. “At the moment, we don’t know if this driver was distracted by a mobile phone, or if it was a case of impaired driving. Acting Sergeant Brown said police were also keen to speak to the two drivers who had to swerve out of the way. Witnesses and anyone who was involved can call police on 131 444. The video should act as a very timely reminder to drivers ahead of the long weekend. Double demerits are in place across the Queen’s Birthday long weekend and will remain in force until midnight on Monday, September 25. Double demerits apply to mobile phone, speeding, seatbelt, red light, drink and drug driving offences.